This 3-week healing plan will assist you in releasing and healing the emotions and beliefs your body holds that keep it from healing. Your body takes on repressed emotions. It is also obedient to your thoughts. Until you heal at the emotional level and train your mind to believe you can be physically well, you will have difficulty healing at a physical level. By clearing old energy from your mental, emotional, and physical energy fields, you will open your body to its natural, God-given design of regeneration and healing. At the end of this 3-week healing plan, you will have opened your body to its power to heal. You will be living in the energy that attracts correct resources to aid your body in its healing process. 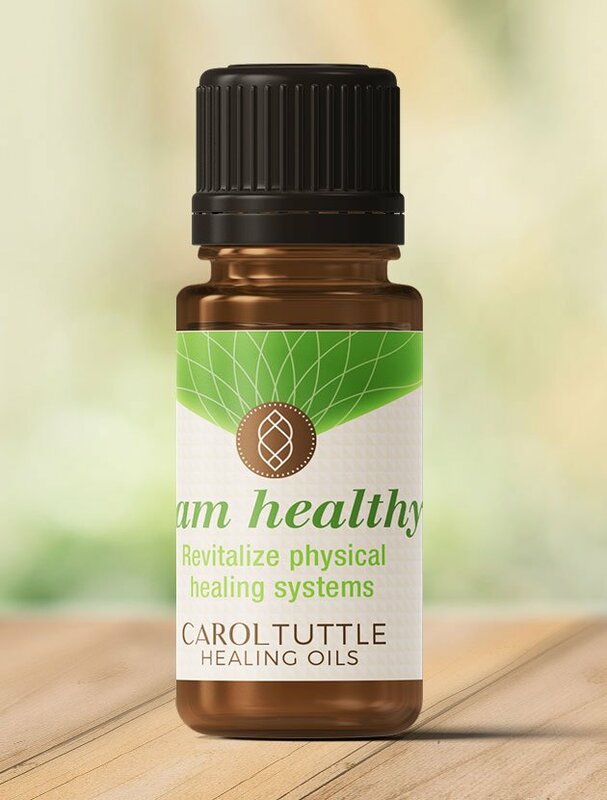 The oil customized to support you in this Healing Plan: I am healthy. The list may look long, but the techniques are quick once you’re familiar with them. Each technique resets beliefs and emotions to facilitate your body’s natural ability to heal. Listen here or download and listen on the go. Adapt any wording to fit your personal experience with the illness or disease you are healing. Doing this energy healing technique when you first start your day helps you balance and strengthen your personal energy system, which will support your body in healing. Doing a Clearing Walk for at least five minutes a day is ideal. If you have limited time, commit to doing it two times per week for at least 10 minutes. As you walk, repeat this affirmation: “My body is whole and healed.” As the instructions in this video outline, see which negative beliefs come up as you do the walk. Each day, choose one (or several) of the following sentences to finish. Write your answers in a journal or notebook. Write quickly. No overthinking. See what comes up. Talk to your illness or disease and learn from it. Become friends with it, rather than enemies. This provokes a power of love to come alive in your body, which empowers your body to heal. Sound healing, using Tibetan healing bowls, helps you process, clear, and ground your energy. They activate your energy centers to help you express your true self with more ease. Listen to this track while you do your morning energy routine, clearing walk, daily journaling, or as you fall asleep at night. This general clearing will support you in letting go of hidden emotions and beliefs that keep your body from healing. Repressed emotions held in the body interfere with your natural ability to heal. This clearing helps free your body of fear energy that you may or may not be aware of. Include in the clearing statements during this session any beliefs that include the fear that you may never heal or get well. There is a strong possibility that on some level, you believe you need your illness or disease. Is it protecting you from something? Is it a family pattern that is just continuing with you? Did you get more attention when you were sick as a child? The subconscious mind will win out and keep the illness around to make sure your needs are met. Use this session to help you manifest a healthy body and to attract to you all the resources that will support you in achieving full and complete health. During the session, allow your body to relax and receive the healing sounds of the bowl. Use this meditation time to see your body whole and healed. The other sessions you watch this week will vary from last week, but this one stays the same. Watch it again. Go through the exercise. Let things go. You may have hidden beliefs that insist that you need to stay sick, or that is not safe to be healthy. This technique will help you release those beliefs. In the stage of childhood development from 13-18 years old, you needed to feel that it was safe to leave your family and grow up and become an adult. Staying sick keeps you from taking full responsibility for your life as an adult. So this session will help you clear any old fear and resistance that you may carry that are keeping you sick. Anger is one of the most common repressed emotions hidden in the body, sometimes without our awareness. Use this session to release anger repressed throughout your life and any generational anger that has never been healed. Set the intention that you are letting go of all of the anger that you have had about being sick. Before you move on to this week’s new sessions, go through this exercise again. The repetition helps to ground the new, healthy pattern into your body. Repressed emotions and beliefs are held in the body which interfere with your body’s natural ability to heal. This clearing will help free your body of all grief and sadness energies that you may or may not be aware of. Also, set the intention while doing this session that you are letting go of all of the grief and sadness that you have had about being sick. This session is a repeat from Week 1. Use it to help you manifest a healthy body and all the resources that will support your full health. During the session, allow your body to relax and receive the healing sounds of the bowl. If chronic pain is a part of your experience, this session will help you. This technique can help you know if a supplement, healing technique, or resource is supportive to your body. Clears unhealthy energies from the body. Regenerates the body’s healing systems. Increases overall physical health. Leopardskin Jasper: Leopardskin Jasper helps draw into your life whatever you need for physical healing. Attracts sources of greater harmony and repels the negative influences that create disharmony. Dark Green Aventurine: Dark Green Aventurine initiates a deep purification of the physical body, especially the vital organs. Aventurine energy permeates the body and then focuses on your most distressed organ, filling it with healing energy and encouraging it to release its accumulated disharmony. Once this organ has been uplifted, your next most distressed organ receives Aventurine’s attention. Thus, organ by organ, Aventurine helps heal and purify your entire body.